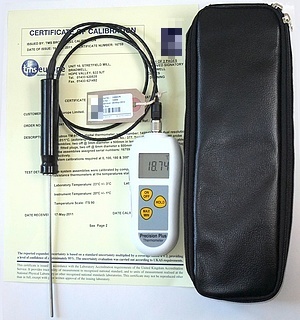 A hand-held digital thermometer that measures to 0.01° resolution, with a detachable hand-held temperature probe, UKAS calibrated as a system 6 temperatures between -18°C and 165°C. The hand-held probe is 3mm diameter, 150mm long, with 1m PTFE lead and contains a 1/10th DIN Pt100 bulb. Warning! The probes supplied with the Ref-Therm 30 are delicate, they should not be dropped or bent within 50mm of the tip as this is likely to cause damage. Any physical damage is not covered by the TMS warranty.